For many years, Thule’s Perspektiv Daypack served as my everyday backpack as well as a bag for transporting my photographic equipment. When I learned that Thule was releasing a new photo bag, the Thule Aspect DSLR (TAC-106K), I couldn’t pass up the opportunity to try it out for myself, especially since it features a compartment for transporting a tablet (the main shortcoming of the Perspektiv Daypack) as well as a larger storage compartment. After testing out the Thule Aspect DSLR photo bag for over a month, here is my user feedback. 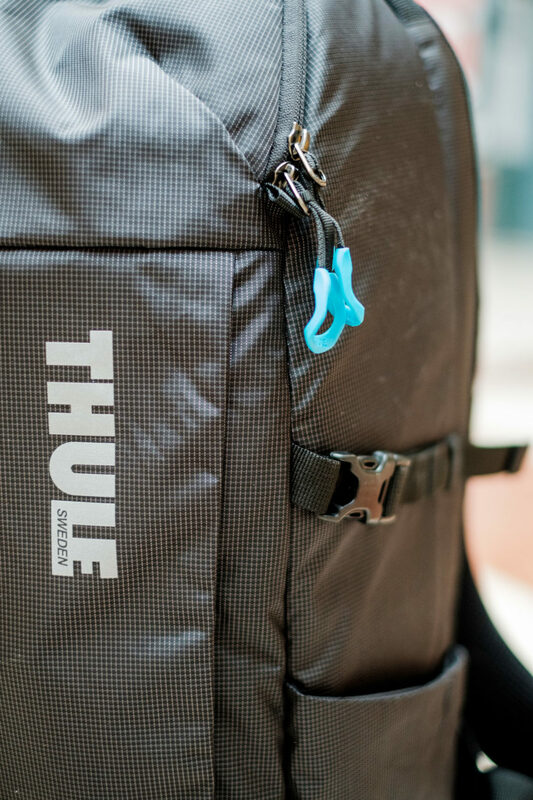 Thule is a Swedish company renowned for its automotive accessories such as its roof boxes and its ski and bike racks. For the last few years, this company has also been producing highly ergonomic and well-designed carrying cases for photographic equipment and computers. 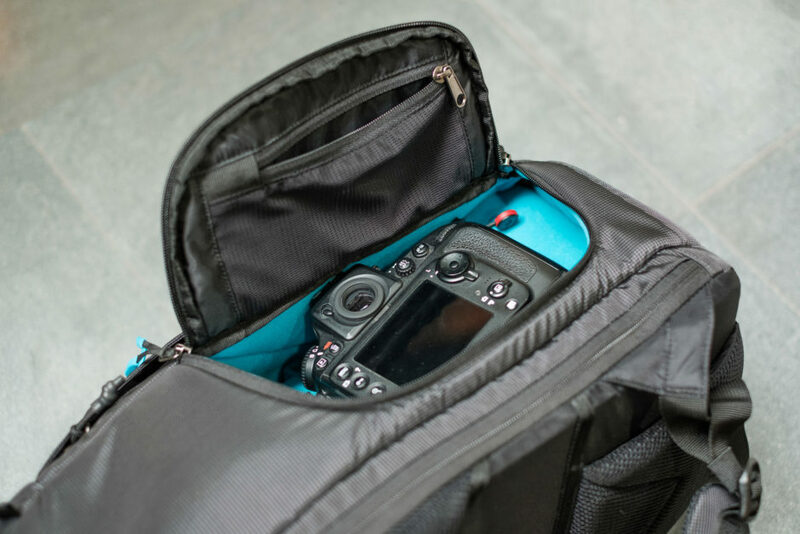 The Thule Aspect DSLR is a photo bag which offers a good amount of storage space – the configuration of which can be adapted to suit your particular needs. 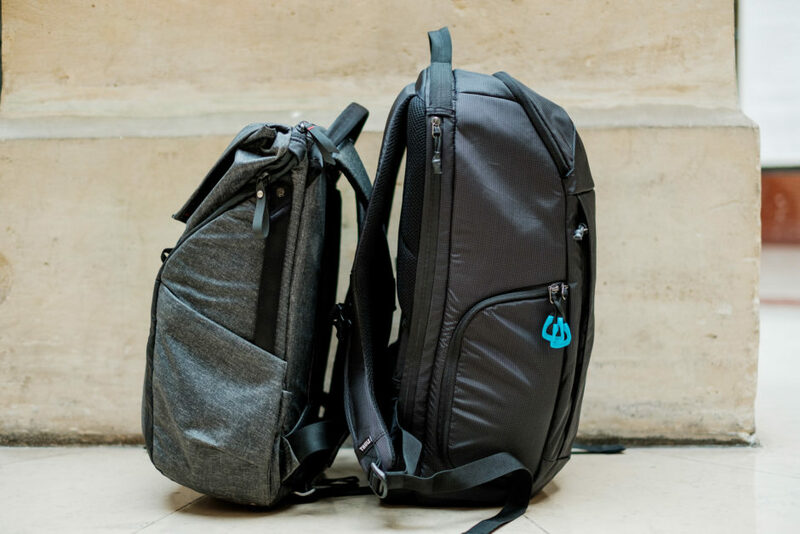 It distinguishes itself from traditional photo bags by its sober look and its capacity to be used as an everyday backpack by removing the foam inserts from its photo compartment. 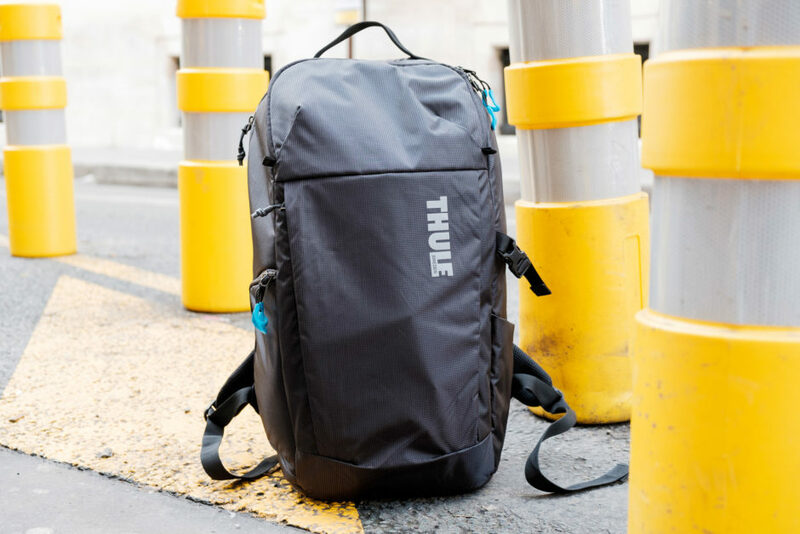 The Thule Aspect DSLR’s outwards appearance is minimalist: this bag has a single zippered pouch on its front side which can be used to store and have rapid access to small accessories, a small booklet or any other kind of document. 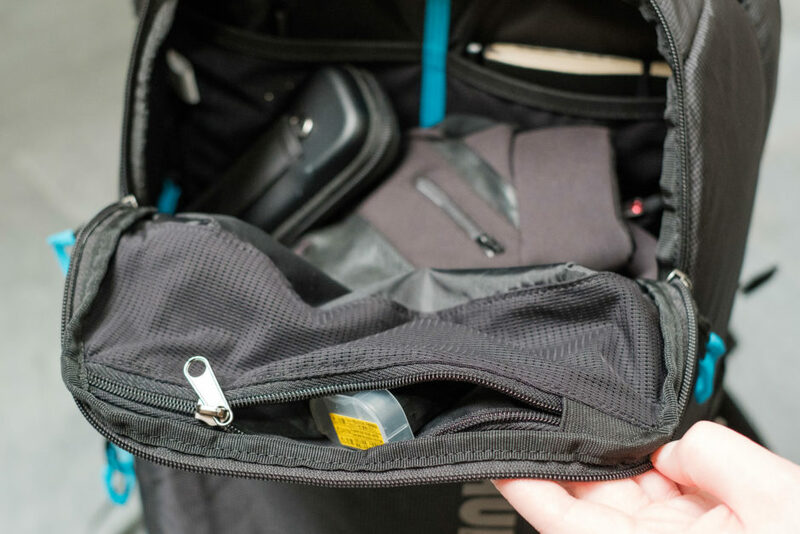 The remainder of the bag’s storage space is located on its inside, except for a small, unfastened pouch on its side which is capable of holding a mid-size tripod or a 1-liter bottle of water. it would reduce the amount of pressure exerted by the computer on the wearer’s lower back whenever the bag is fully loaded. This bag allows you to access your photo equipment via a side opening by rotating it to face towards you. Unlike the Perspektiv Daypack, this bag’s photo compartment is not removable. As a result, it is not possible to close and remove this compartment in order to store your photo equipment somewhere else – in a hotel safe, for example. A small zippered pouch inside the photo compartment will allow you to store a few memory cards or sheets of paper, but because this pouch may be in contact with your camera’s display when the bag is closed, it is best not to place anything too thick into it, as doing so may lead to scratching of your camera’s display. At the top of the bag, a wide opening will allow you to access the compartment reserved for storing your personal belongings. This compartment provides a good amount of storage space which can be extended to include the entire bag by removing the foam protectors from the photo compartment and folding the divider wall against the back of the bag. Within this storage space, a zippered pocket can be used to store batteries or memory cards and two other small pockets (one of which has a key ring) can be used to store a few sheets of paper or a few accessories – in order to keep them from moving around. The zippered pocket located on the back side of the opening flap is not very practical since the fabric used in the bag’s construction is not very rigid: if you put anything too heavy in this pocket (such as a battery), the flap will fold outwards the moment the bag is opened. 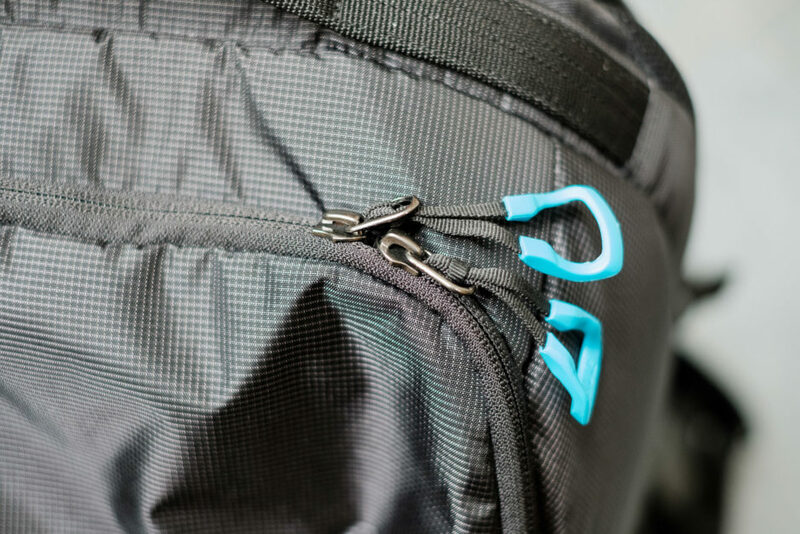 Every time that you open this zippered pocket to remove something, you will also need to ensure that its contents do not fall out. 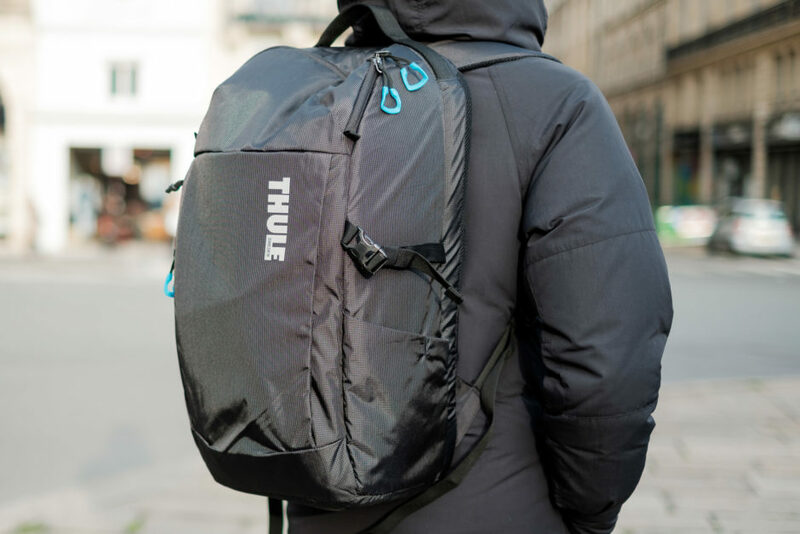 Given the way in which this bag was constructed, Thule could easily have inverted the zipper’s position, in order to make it face upwards rather than downwards – as is the case. This sporty looking bag has some of the features as the Perspektiv Daypack which I previously tested. There are blue plastic end caps on the exterior zippers which will allow you to open the bag even while wearing gloves. 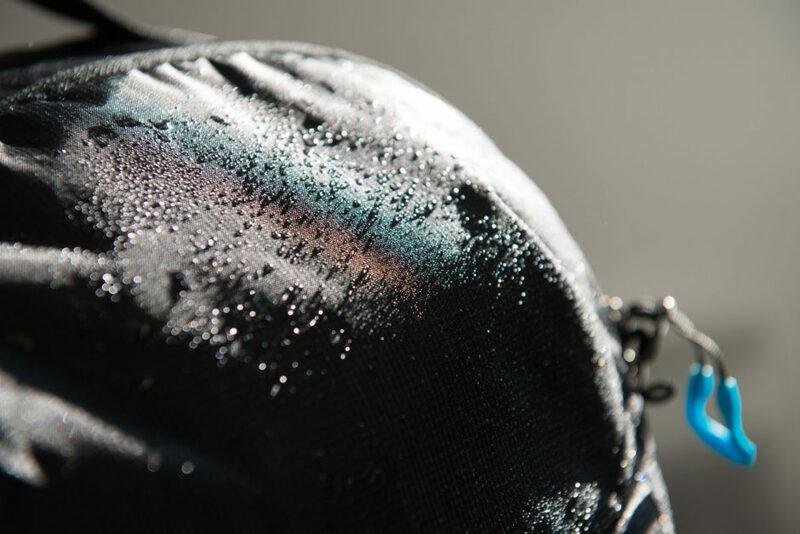 This bag does not have a rain cover but its outer surface is water-repellent which should provide a measure of protection against rain. I really would have liked Thule to have included a complete cover, for protection against heavy rain, especially since this bag’s zippers are not water-tight. The black nylon fabric used in this its construction and the light gray lines running across its surface give this bag a unique urban look and from a distance, it appears gray in color. Its nylon material is rather thin but seems quite durable. The material used on the bottom side of the bag is not any thicker than that used everywhere else. Even though I did not encounter any problems during testing, I would have preferred to see some additional reinforcement in this area in order to avoid long-term wear and tear. The Thule Aspect DSLR is quite large (30 x 22 x 52 cm). For maximum carrying comfort it is equipped with a chest strap as well as a removable waist belt – to be used during long outings or whenever the bag is heavily loaded. This belt is well-padded and can be easily removed. On either side of the belt, net pockets can be used to store photo accessories such as a lens cap. 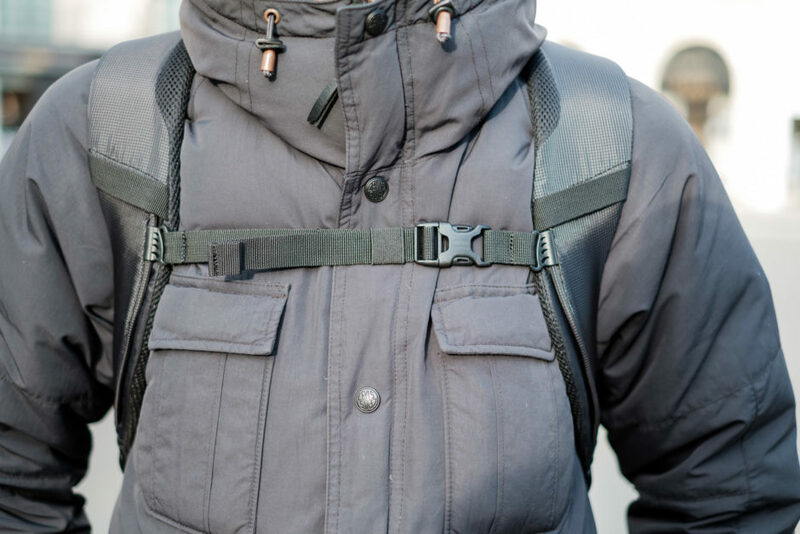 Compared to the Perspektiv Daypack, the removable belt is a real advantage since it does not take up any room when it is not in use. The fact that it is removable also allows it to be more heavily padded. The back panel and shoulder straps are also padded and despite being a little rigid, this bag is quite comfortable to wear – even when fully loaded. When it is empty, this bag weighs 1.4 kg, making it one of the most lightweight photo bags around. The padding used in the back panel is supposed to be “breathable”, but I was unable to verify this claim as I only tested this bag in winter and while wearing a heavy winter jacket. This bag has a handle on its top side to allow it to be carried by hand. It would have been nice to also have a side handle since there is often need to hold this bag horizontally – something which is not very easy to do. The Aspect DSLR can hold a lot of equipment: computer, tablet, photo equipment, and personal effects. Fully loaded, this bag is reasonably comfortable – although not necessarily the most comfortable. Tightening the chest strap helps to better distribute the weight. 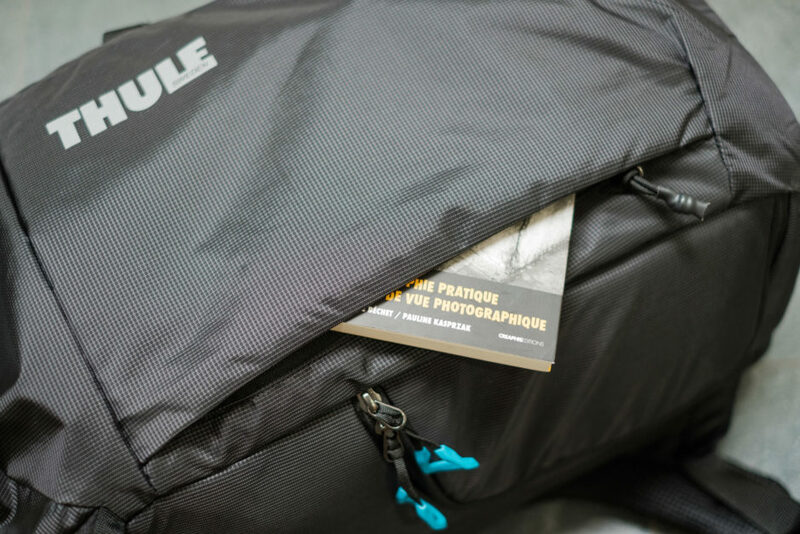 What photographic equipment can you carry in the Thule Aspect DSLR? Let’s talk about this bag’s carrying capacity for a moment. The photo compartment is located in the lower portion of the bag and has a single side access point. It is also possible to carry bulkier photo equipment by occupying the storage space intended for personal effects, although this storage compartment is not padded. In this bag´s default configuration, I was able to fit one full frame reflex camera (with a 24-70 mm type lens mounted on it) as well as two additional professional lenses: a 16-35 mm lens and a 50 mm lens. 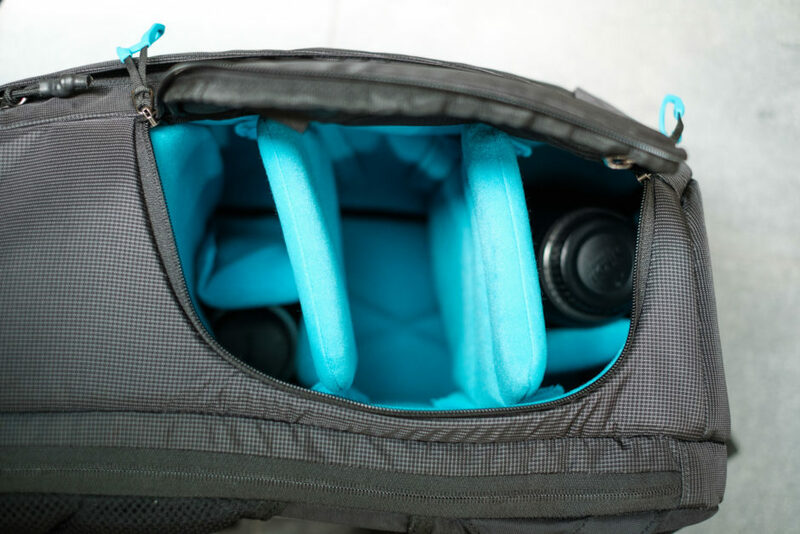 The photo compartment is divided into three different sections by means of two turquoise foam dividers which give added protection to anything stored in the compartment and which make it easier to organize various accessories. It is possible to fit the Nikon D800 in this configuration, but it takes up a lot of room. If you intend on transporting a full frame reflex camera, you may have some difficulty in also fitting two large lenses. 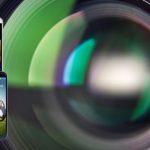 However, you shouldn’t have any difficulty doing so with a standard reflex camera. Compared to the Thule Perspektiv Daypack, the Aspect DSLR has more space for photo equipment (which still only represents half of the bag’s available room). This is why the Aspect DSLR can be considered a multipurpose bag rather than a specialized photo bag. 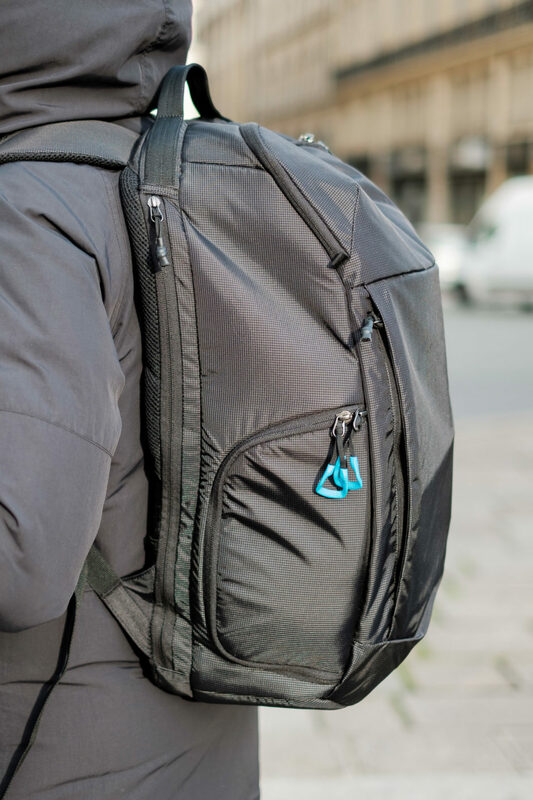 Thanks to its modular design, it can be used as an everyday backpack by removing its foam inserts or folding them against the sides of the bag. 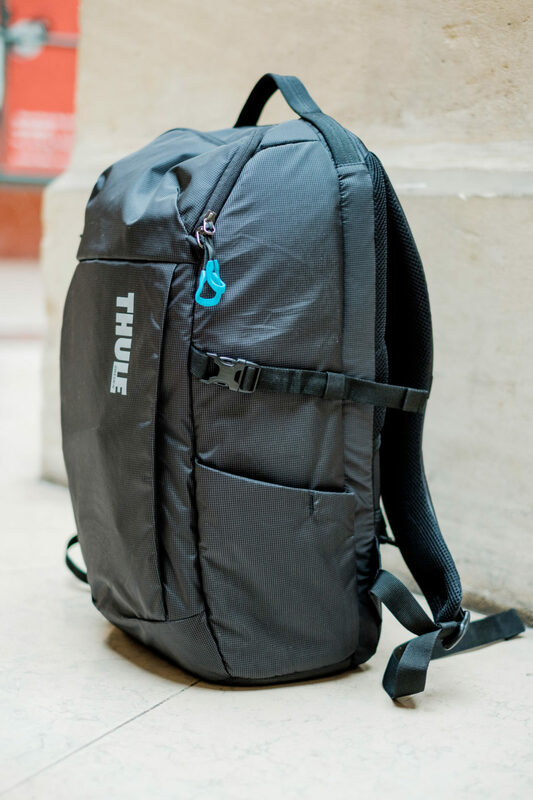 In conclusion, the Thule Aspect DSLR is a versatile photo bag with an urban look. It is an improvement over the previous Perspektiv Daypack product line. 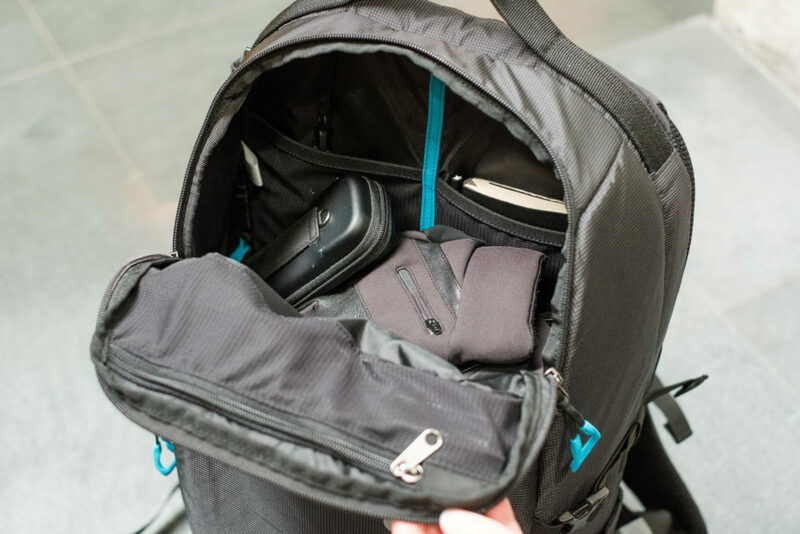 With thicker padding, it also features computer and tablet compartments as well as more room for the wearer’s personal effects – features that the Perspektiv Daypack lacked. Its removable waist belt is also a nice feature although it is only really useful for certain types of excursions.